Okay, here we go. Another crawfish adventure... After the epic fail of a meal, otherwise known as Crawfish King, I had a difficult time convincing anyone from my softball team to try out GVRD's other crawfish joint. I would enthusiastically mention after our games to no avail. The responses ranged from ignoring me to nervous indifference. Alas, it seemed like a monumental task to convince anyone to eat at Cray Kitchen and Bar, even though they have nothing to do with Crawfish King. Finally I had a taker, in fact 3 takers. Herbie the Lovebug, Lana Banana and their sidekick agreed to the task. In fact, Herbie the Lovebug was stuck in neutral regarding this meal. Generally, he doesn't prefer eating with his hands and also, the perceived value just wasn't there. To be fair, all these types of restaurants, whether it be Crawfish King or the Crabpot in Seattle, are never places one should visit for a cheap meal. You pay for the experience. Whatever the case, we made a reservation for 7:15 on a weekday. Turns out the novelty of the crawfish thing was still in full force as the place was packed. Originally, we were offered the table right at the front door, but it really couldn't accommodate 5 people without creating an obstacle for others to cross. So we had to wait for a different table at the back which didn't become available until 8:00pm. We decided to get a good amount of food since a boil isn't exactly a filling experience (all those shells). 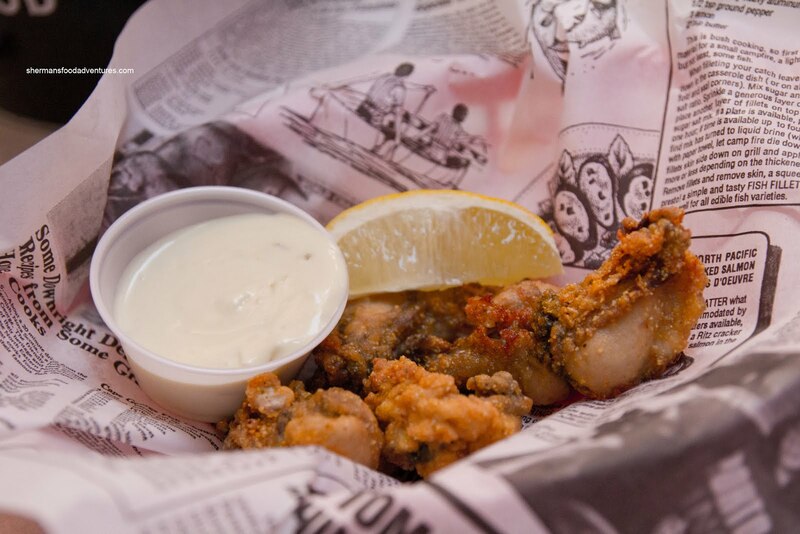 In addition to our Southern boil, we started with some Fried Oysters. For $9.99, it was an unimpressive basket of food. Yes, we do realize that oysters (especially certain types) are quite expensive. But 5 small little oysters for $10.00? If they do intend to serve these types of oysters, then I suggest they "prop" them up with either shredded lettuce or a bunch of fries. Hence, it would at the very least look like more. Size withstanding, the oysters were actually quite nice being fresh and just cooked. Seeing how we were already getting potatoes for our boil, Herbie thought that fries would be somewhat redundant. 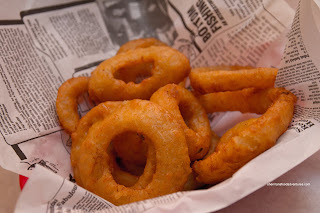 So he suggested we get an order of Onion Rings. Again, for $6.99, it was a meager amount. They were thick and fried crisp. Not bad. Pretty typical onion rings. Now onto the main event - the Southern Boil! We got 5 lbs. each of the Crawfish and Shrimp in a the everything mix in medium. We added 3 potatoes, 3 corn and 12 slices of andouille sausage. Everything came a little at a time, which was welcomed since our table was really small. 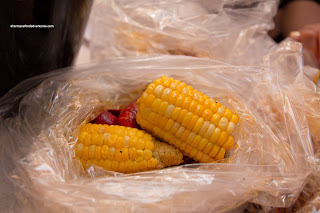 Moreover, that ensured our food would be hot and fresh. The crawfish came in various sizes (which is normal) and were cooked nicely. Viv and I thought these were "muddier" than the ones we had at Crawdaddy a few months ago. Not that the restaurant can necessarily control this, it was just an observation. We liked the spice level as well as the abundance of garlicky flavour. The "sauce" was very powerful. 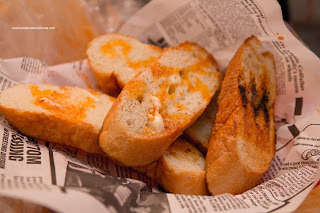 So much so, we had to get a side of Bread to soak it up. We would've preferred that it wasn't grilled since it was a bit too crunchy. Just give us a baguette and we'd be happy. 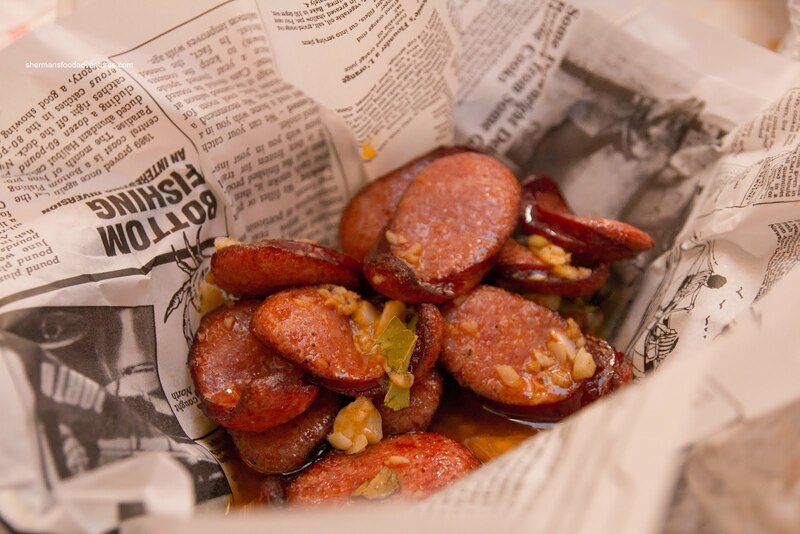 Compared to Crawfish King, the sauce was much less greasy, which made it easier and more enjoyable to eat. 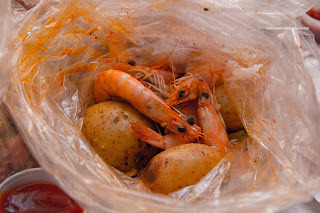 As for the Shrimp, 4 bags were perfectly cooked where the shrimp had a nice snap and were super sweet. However, one bag was woefully overcooked. The meat was literally mush. For a moment, we considered the chances of it being spoiled, but since the shrimp are usually frozen fresh from the source, that shouldn't be the case. The 3 Potatoes were pretty decent in size and were nicely prepared. They were in one piece with no disintegration, yet were nicely soft inside. The Corn was sweet and the niblets still had a pop. Lastly, they served the Sausage on the side (mixed with sauce) because it would be easier for us to find. Good idea, but then again, the whole point is to have them cooked with the seafood (can't win with either way). They were good though, with a slight spice and a nice snap. They were a touch overdone with some of the edges being hard. Okay, to compare this experience with Crawfish King, it wouldn't even be fair because nothing could be worse. However, as a whole, the meal was pleasant enough. The service was friendly and attentive while the food was okay. To be fair, this type of eating will never be "cheap" due to the lack of competition and high raw material costs. So don't expect to leave spending under $30.00 each. 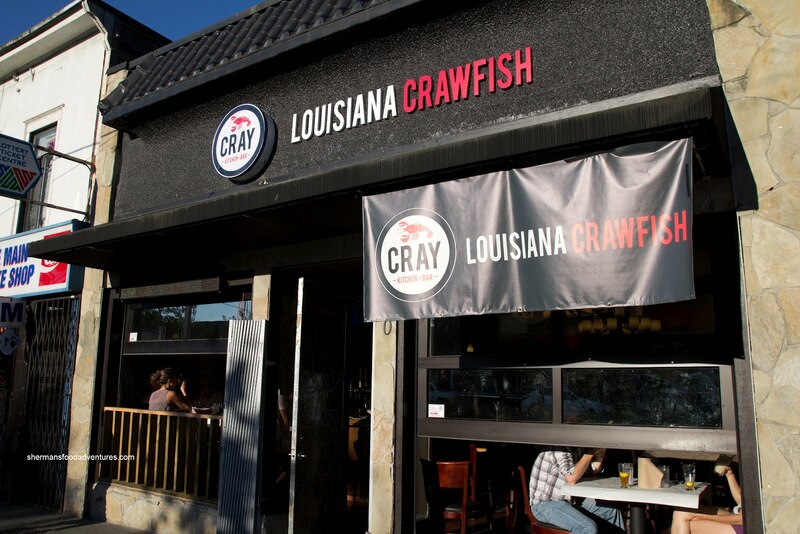 But if you must dine this way, Cray Kitchen is a better option than Crawfish King. Just wondering how much are charging a pound for the crawfish. Had great crawfish down in LA in the summer at the boiling crab, think it was like $2 a pound. Bill average out to something like $12 a person, with plenty of left over. Shows you how over price this city is. *smacks head* I knew I should have tried it when I was in the states. 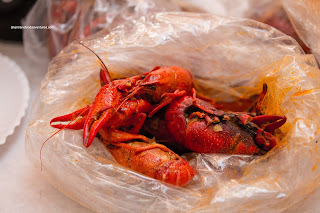 I'd rather just wait to try it in the US than in Vancouver as I'd have to question the freshness of the crawfish - that and I don't feel like paying $15.99 for it...yikes! Sherman, I have enjoyed reading your blog since the beginning but have lost all respect for you. I get that you had a bad experience with the other place, but stick to reviewing and not comparing and complaining. The number of references to your bad experience where too numerous, it felt like I was reading a rant. Hi! Big fan of your blog! My family of 5 went here and the best way to eat here is to order the seafood combo. The menu was confusing, the combo is actually priced per order not per person. So in our case, we ordered 2 orders of the Crayving Combo at $50. I believe it comes with bread too but we requested for rice instead. We were all very full with just that but no leftovers! @Mylemonlime Actually, I've been back since and have had the combo. Not bad. We ordered some po' boys too. Oh and thanks for reading!! !